Now, many an Englishperson had told us that Welsh was basically a dead language. 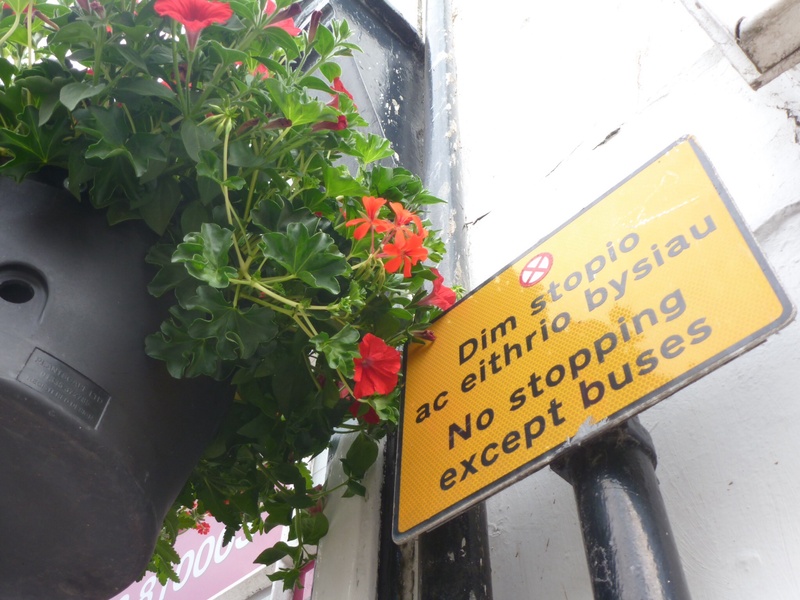 But as we passed signs bidding us ‘Croeso’ to places such as Lladundon and Gwynydd, it became clear that we were in a very bilingual country…more bilingual, even, than Canada! This comparison between Welsh and Canadian bilingualism got me thinking. It’s not a fair comparison, because Canada’s two languages are both colonial, whereas Welsh is a native (in the most general meaning of the word) language that survives despite the presence of English. A more appropriate comparison would be between English (or French, in Quebec) and the multitude of First Nations languages that have been present for thousands of years. What has allowed Welsh to survive while less than 1% of Canadians still claim a First Nations language as their mother tongue? And what can Canada learn from the Welsh success? As Canada tries to recover from centuries of colonization, these are definitely things worth addressing (though this applies to the nation as a whole, I will speak only to my own experience, which is in Manitoba). The obvious answer to this question is financial support. The UK government pours significant amounts of money every year into keeping Welsh alive. 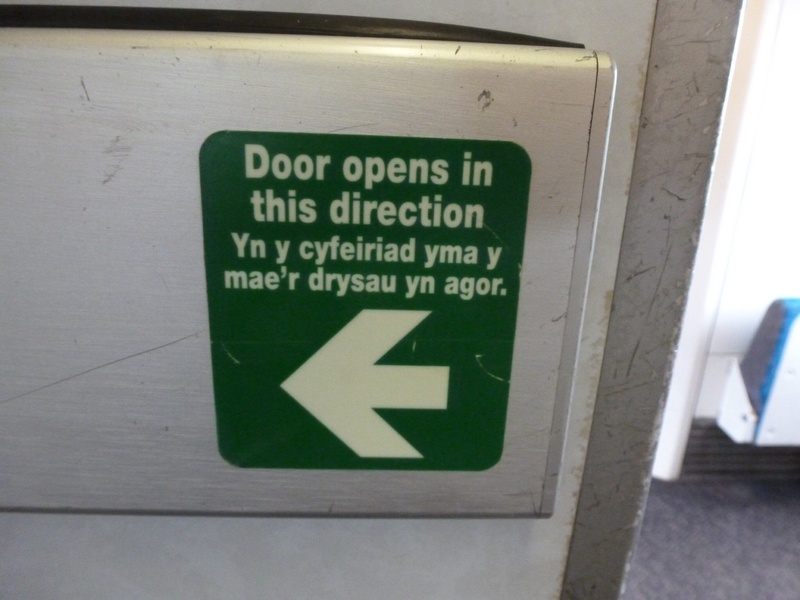 All official signage and documentation are in both Welsh and English, with Welsh usually being more prominent. 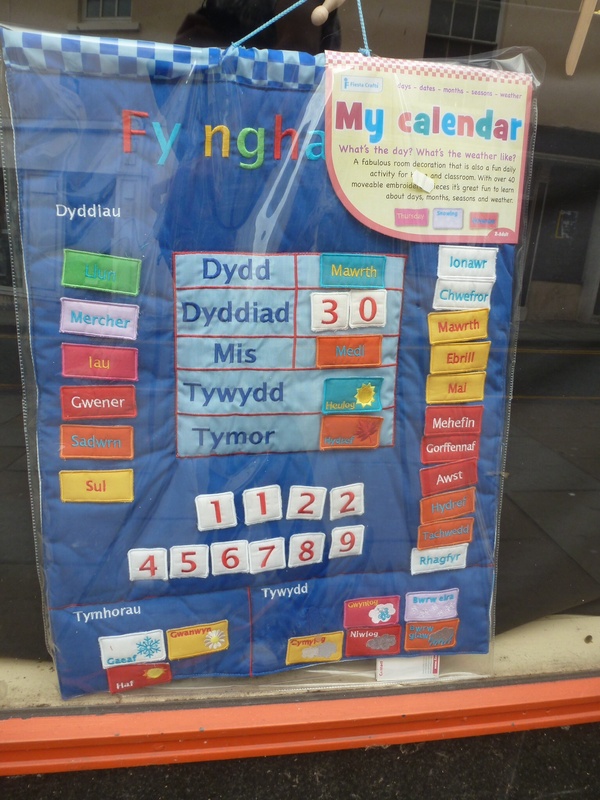 The majority of schools in Wales are taught in Welsh, and basic Welsh is mandatory throughout all grades even in English-language schools. Meanwhile in Manitoba, public text does not include First Nations languages until the 58th parallel (which is basically Churchhill and that’s it), and schools must design their own curricula and materials if they want to teach a First Nations language. 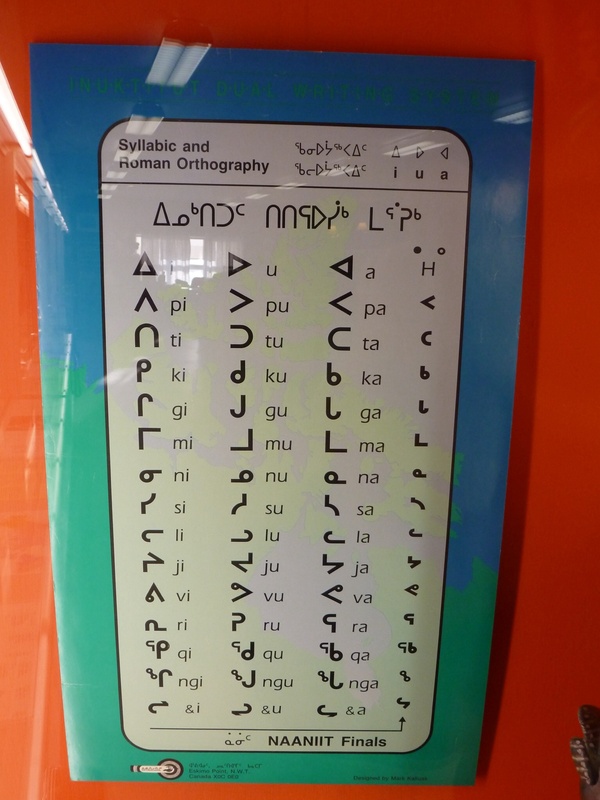 The most common objection to the use of First Nations languages in public institutions (including schools) is that there are simply too many of them. In some respects this is valid: it would be impossible to choose a single language to represent the diversity of a land this massive. But considering that 30 Waleses could fit into Manitoba alone, it is not unreasonable to propose that the Wales-sized plot of land around Winnipeg could include Anishinabe in its public texts while the Wales-sized plot of land stretching from The Pas to Gillam could include Cree, etc. The next anticipated objection is that a country cannot function when divided into so many linguistic groups. To counter this, we jump ahead in our voyage to Switzerland. Quite possibly the most stable country in all of history, it is split into four distinct language districts. Street signs, schools, and even food labels switch languages entirely within the same country. In fact, while visiting the Italian-speaking canton, our Swiss German cousin had to speak to the gas attendant in English to be understood. Yet the Swiss are undoubtedly Swiss, and have been for 800 years. It’s sometimes tempting to believe that language extinction is just a Darwinian fact of life, and that any attempt to fight natural selection is just prolonging the inevitable. In the case of Latin, for example, this is very true. 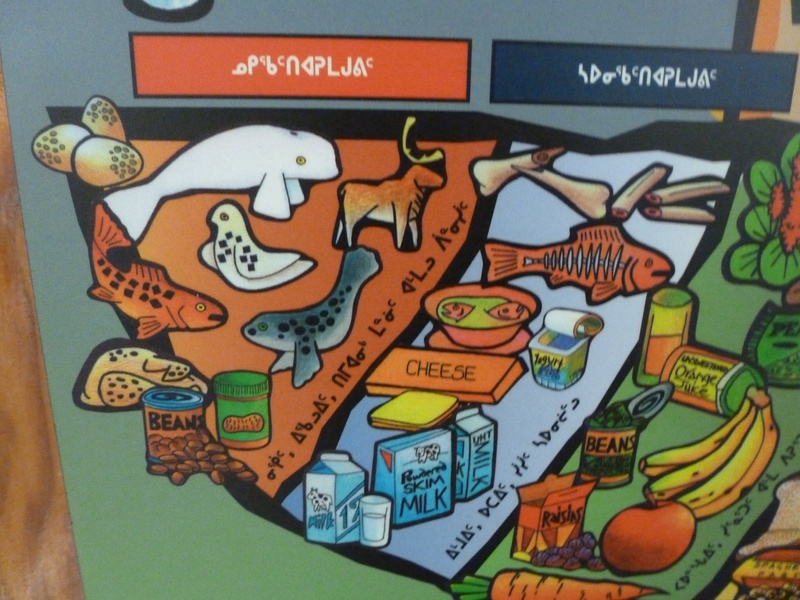 In the case of First Nations languages, however, their pending extinction is entirely unnatural. The systematic destruction of these languages was never inevitable, but rather was artificially imposed in the relatively recent past. This suggests that it is entirely possible to reverse the disappearance of these languages if we support their use in public institutions. 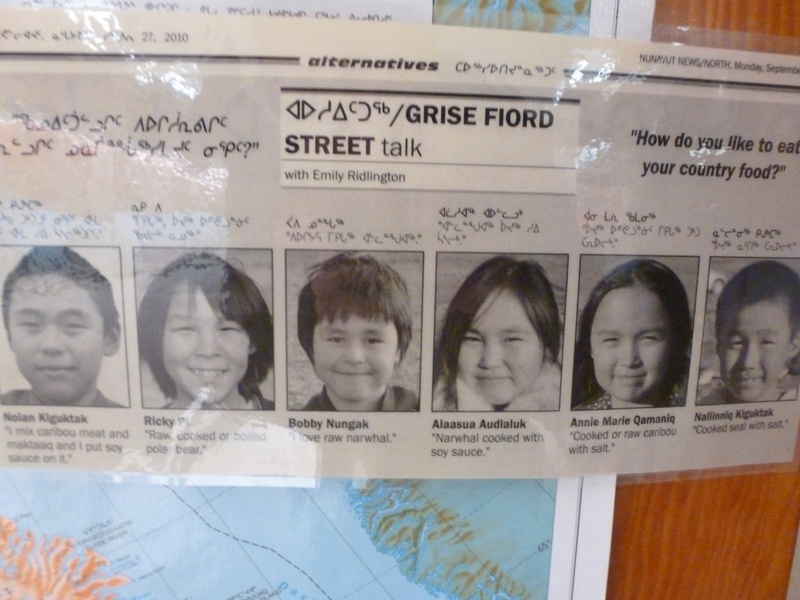 Obviously this would not entirely resolve the centuries of distrust between Canada and First Nations communities, but it would be a significant step, and would ensure that the unique perspectives offered by those languages are not lost. The sky is literally (yes, Phil Cook, literally) on fire with the most beautiful of sunrises as I pass Ashern on the last southbound Greyhound I will take for a long time. It was a complete but emotional goodbye yesterday afternoon. 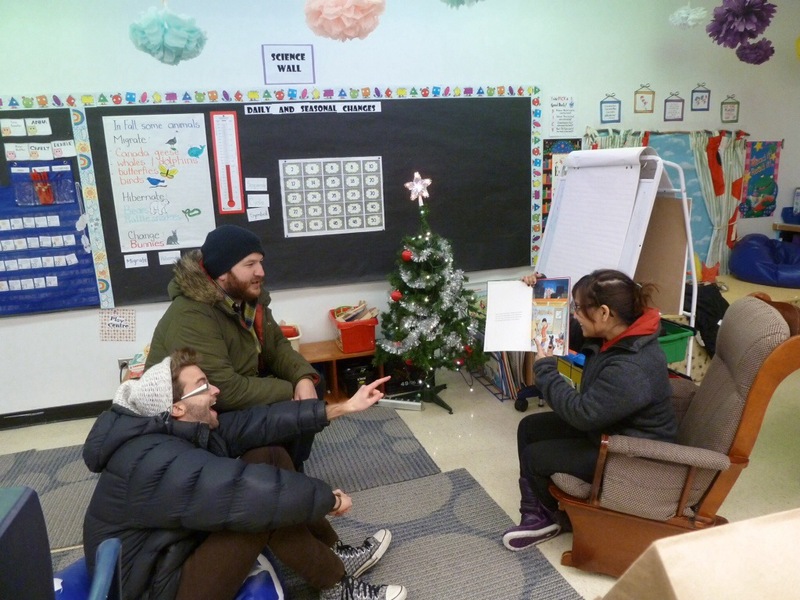 How often, at the end of a practicum block, do you get to visit your students working at the Co-op, and then see their younger siblings biking in puddles outside your apartment shouting ‘tansi!’, or have pyjama-clad brunch with all your favourite teachers? Time, therefore, to catch up on some blogging, while these memories are still as fresh as the heaps of snow that seems to have disappeared some time during the night. Geez, tropical Winnipeg! 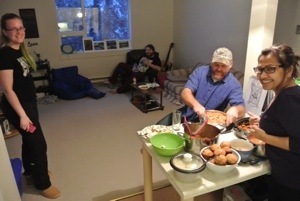 Gillam Round Two began with an epically northern evening. I was faintly aware of something called the Hudson Bay Quest, in which mushers from all around the world race across 300km of open tundra between Churchill and Gillam. 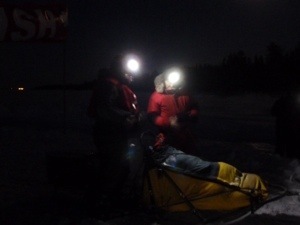 I was eating butter chicken at Gillam D’Lite, the best (read: only) restaurant in town, when we received a text offering us a ride to the edge of Stephen’s Lake to see the first mushers riding. So my CT and I jumped into the eccentric science teacher’s truck and joined the small crowd of spectators around a raging campfire on the frozen beach. Among said crowd were students, parents, and a few dreadlocked Minnesotan punks who had come out to cheer their dad across the finish line. 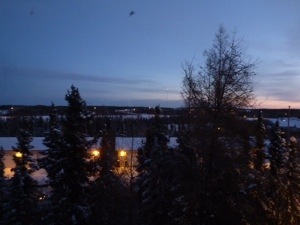 Sure enough, a tiny LED light was visible on the other side of the lake. We watched in anticipation. We kept watching. 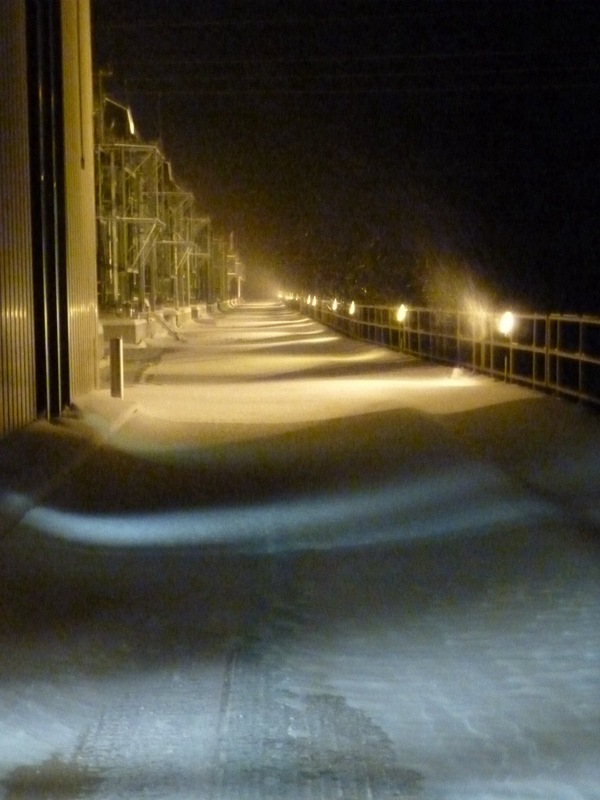 Then we realized that that light was still a full mile away, pulled by some very tired dogs. So we saved our voices for about twenty more minutes, then cheered for the musher and his nine-dog crew as he slid up the shore. We admired his icicled beard, and the voracity with which the dogs devoured their reward of fresh caribou. 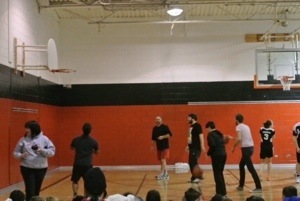 Staff versus student basketball game. I can now cross “give a 15-year-old girl a black eye” off my bucket list. Though we both agree that SHE ran into MY elbow. The first day of spring is a perfect excuse to wear shorts, even in -22°C. A couple of the fantastic middle years students (photo used with permission!) 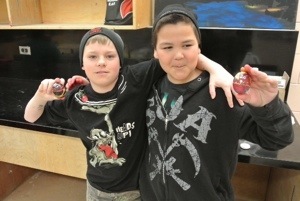 that showed up for our Pysanka workshop. We had a great time hanging out all evening and making some beautiful (if unusual) Ukrainian Easter eggs. My EA friend, Wendell, and his buddy Stephen generously invited me along for an afternoon of goose hunting. It turned out to be an afternoon of storytelling and shooting rounds into snowbanks for fun, but an excellent time nonetheless. 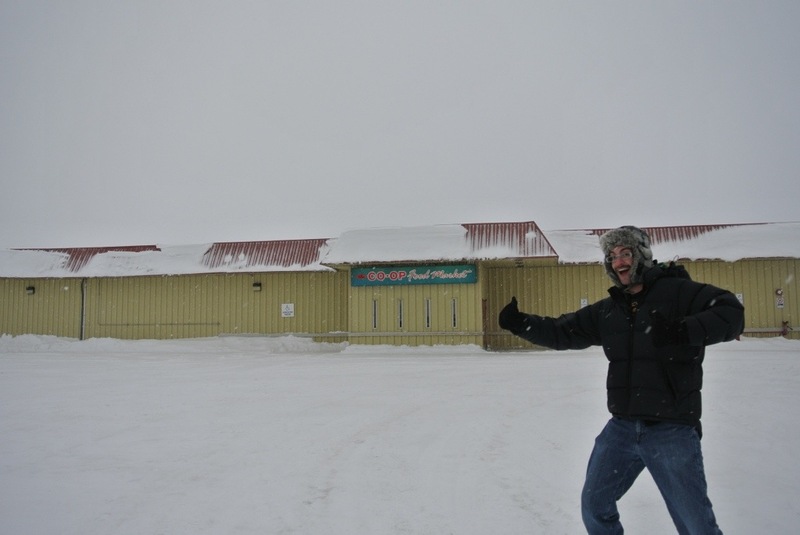 I understand that a town as tiny as Gillam is very much characterized by the individuals who live there, so I count myself very fortunate to have been there when I was, since I cannot imagine a better bunch of people to spend time with! After the last rather verbose post, I figure a photo-exposé of our out-of-school fun is in order. 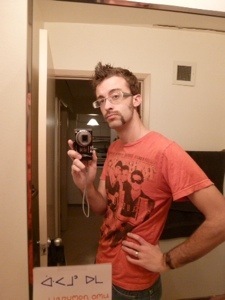 We begin with Movember, which this town has embraced with open handlebars. We cheered on our students, and some friends as well, at the Movember hockey tournament, skipped out on the Movember prime rib dinner (cheap students gotta draw the line somewhere), and tore up the rug (er, concrete rec centre floor) at the Movember social. If I had a baby, I would’ve entered him (or, more humorously, her) in the Moustached Baby Competition, but alas, that will be another visit. 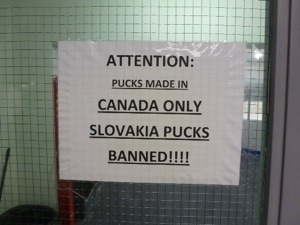 They take their hockey pretty seriously here. Cold War vestige or Olympic hockey grudge? 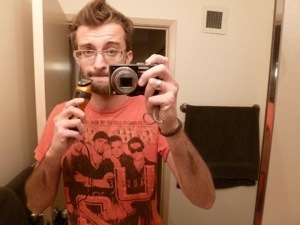 You don’t go to Movember without a mo’! The familiar ham and cheese of Southern socials will just never compete with the Northern tradition of having camp-sized roasters full of bacon. We were fairly liberal with out take-out plates. Let’s go to THE MALL! 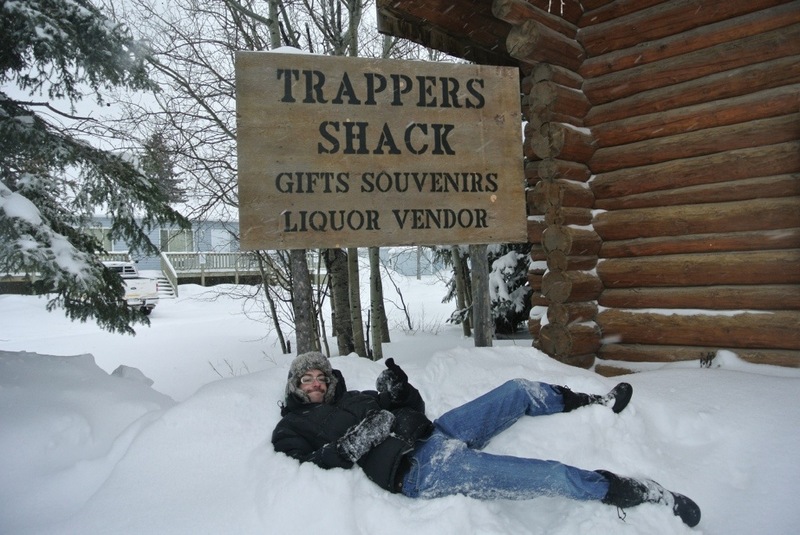 …or, for basically anything else, the Trappers’ Shack! Where I spend the majority of each day. Where I spend the remainder of each day. 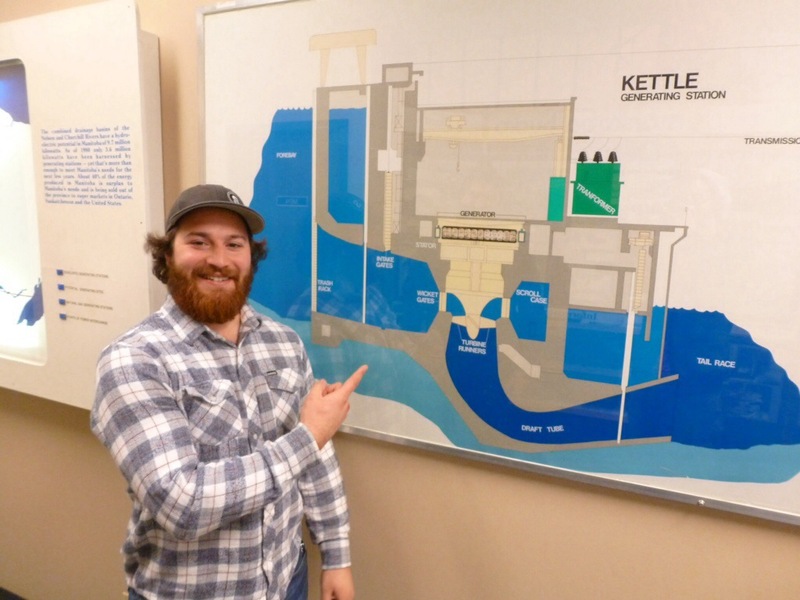 On Monday, then, we received a generous offer from Reid’s high school buddy who is here working for Hydro: an after-hours tour of Kettle Dam, the second largest generating station in western Canada. He kindly accommodated our desire to ride in the supply bikes, and put up with our repeated statements that this would make a great set for a shoot-out in a Bond film. Karl, whose referred to his position at Hydro simply as ‘nerd’. He’d make a good tour guide too, though! 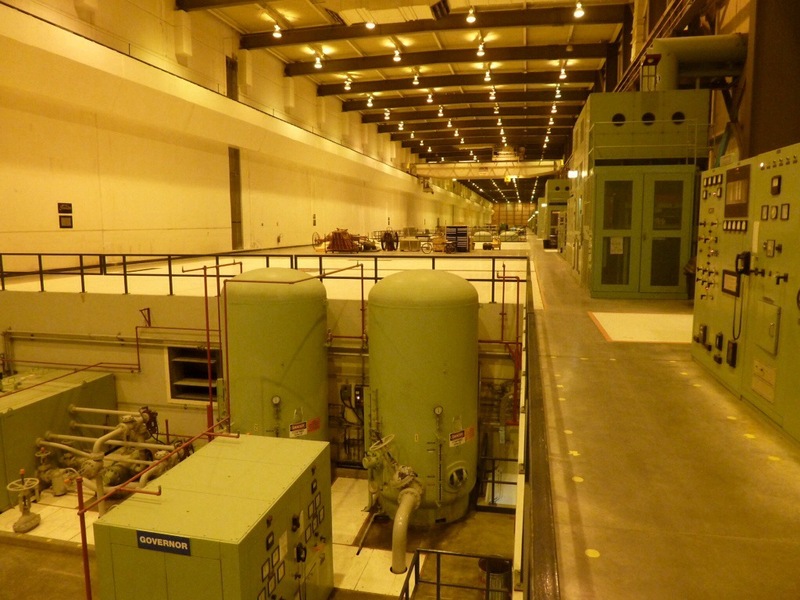 The generating station floor, aka the set for our fantastical James Bond action sequences. 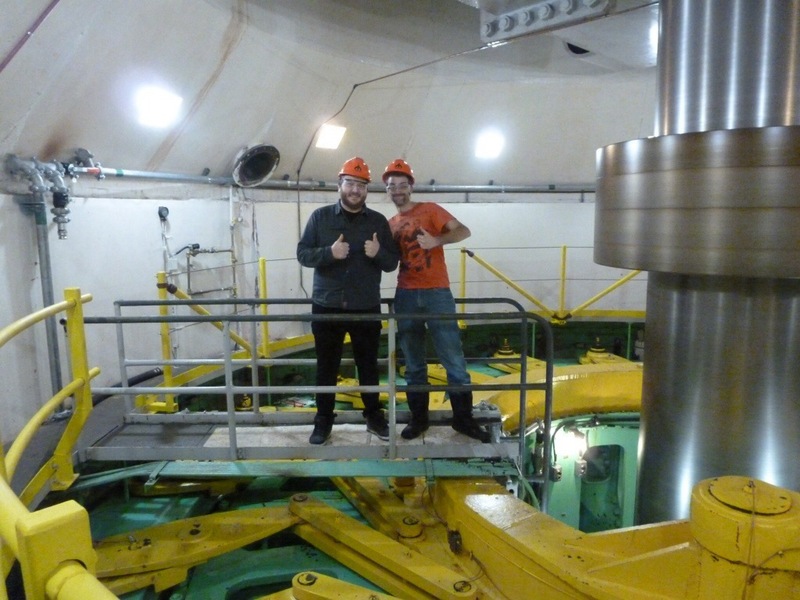 The turbine pit: That steel pillar next to me is spinning at a zillion miles an hour, powering the computer you are reading this on. 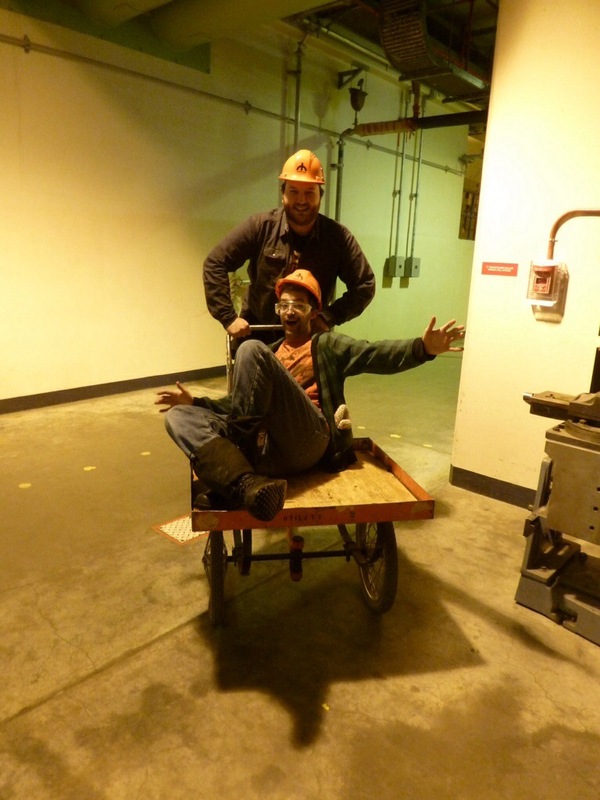 Bicycle carts are used to carry heavy equipment long distances, or stupid tourists short unnecessary distances. 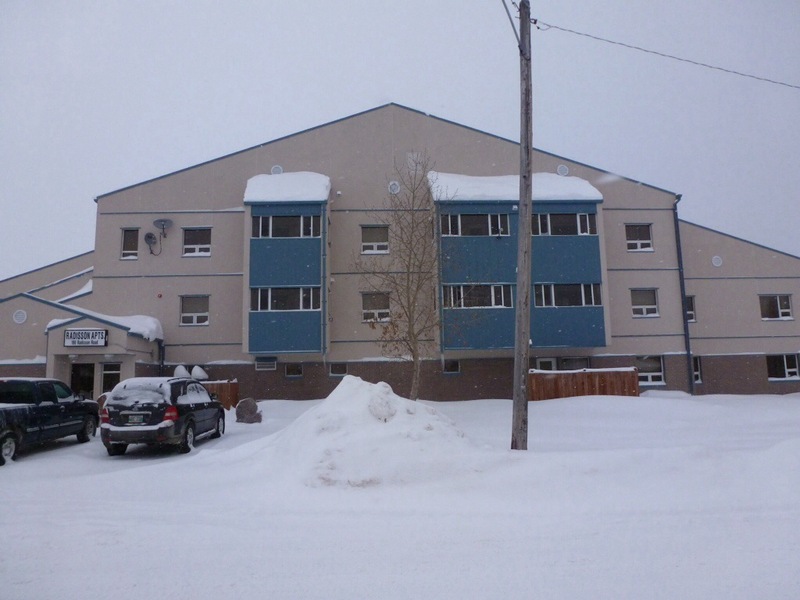 Manitoba Hydro is a complicated subject here, responsible for devastating changes to the natural environment, but also for the huge employment level that keeps Gillam out of the poverty that many northern communities experience. 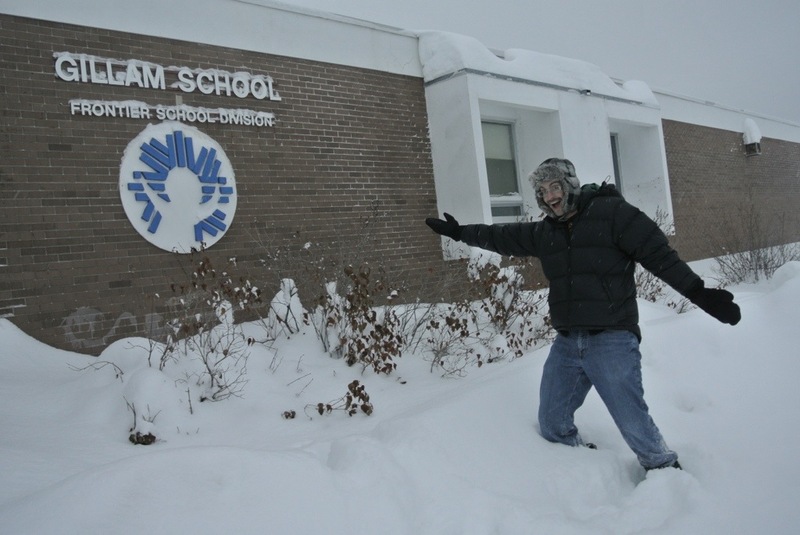 Regardless, this was a great opportunity to see where many of my students’ parents go everyday. Thanks, Karl, for befriending us Southerners and showing us around! 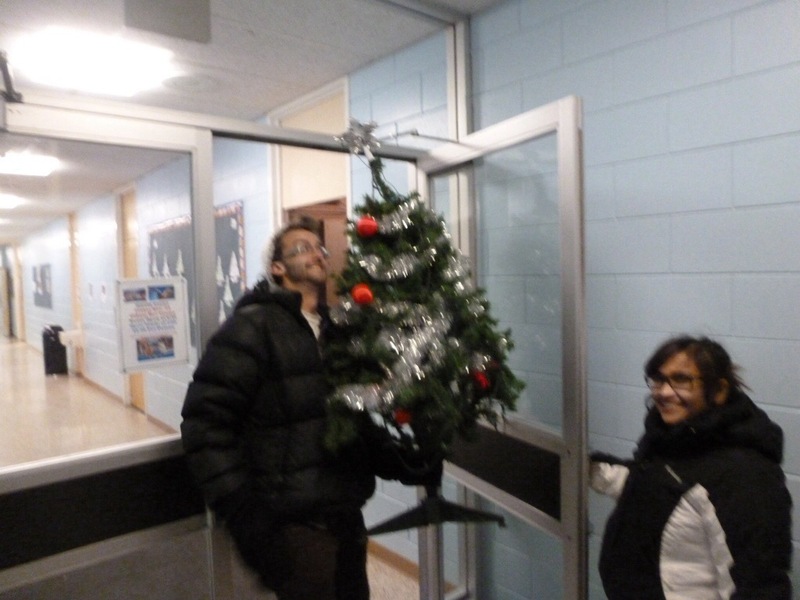 Finally, the Christmas fairy left a fully decorated tree on my balcony when I arrived, so Reid, Sitara, and I snuck it into the Grade 1 classroom, where it will be far more appreciated. Oh to be in Grade 1 again! 10. 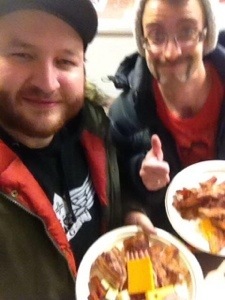 Northern hospitality: Less than 24 hours after my arrival in Gillam, my roommate and I were dining on caribou roast at our CT’s (collaborating teacher) house, talking about family and quoting Fubar (that’s big here). And tomorrow we’ll be heading one block away to my other CT’s house for a Grey Cup party (as such, any bits of CFL trivia you want to pass along would be muchly appreciated!). Thanks Julie, Jen, and Joe for such an incredible welcome to the community! 9. Sports: As the least athletic person in my graduating class, I never envied the sports teams that had to spend every evening being shuttled to some school across the city for games. 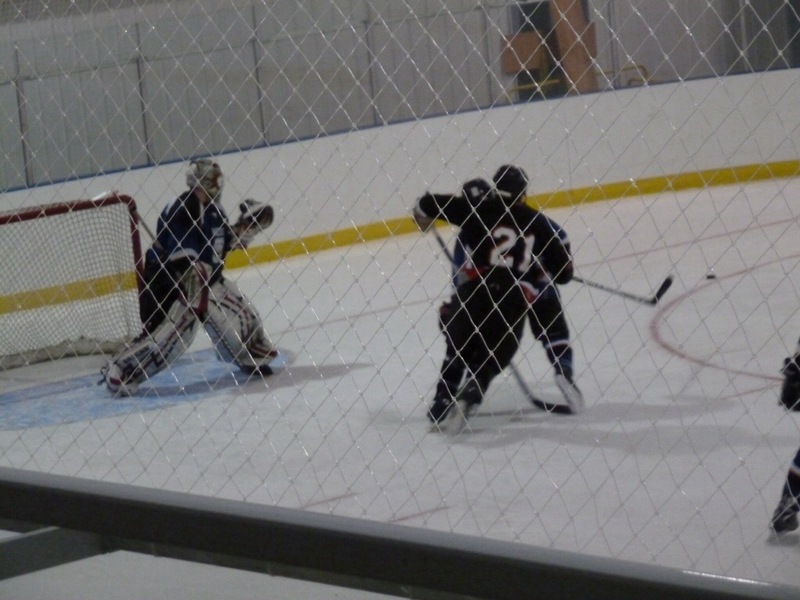 In the North, however, since the games are generally about 8 hours away by train, you gotta make ’em count. 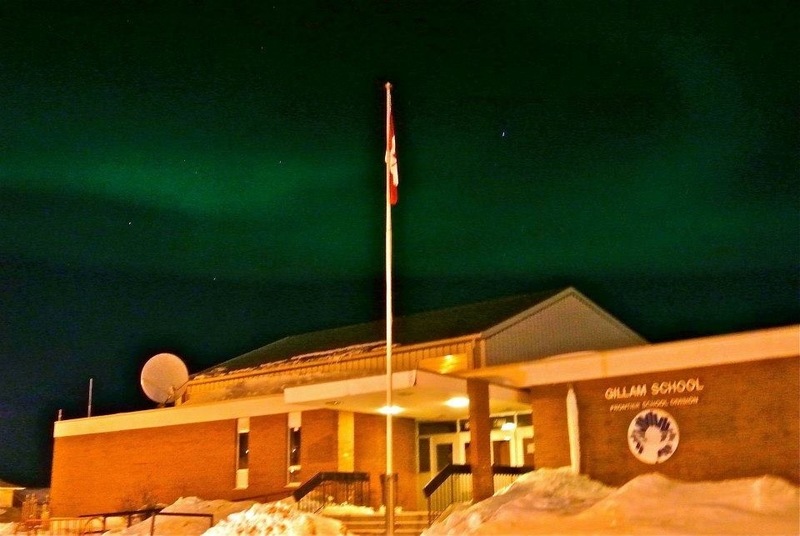 Gillam hosted Volleyball Zones last week, meaning school was cancelled for two days while students from Churchill, Lynn Lake, and many other communities all slept in our classrooms. It felt more like a youth retreat than a tournament, as I had the honour of supervising the games room, working on my killer ping pong skills. 8. DIY Catering: Of course, a sports tournament needs a canteen. But whereas a city school would have all kinds of regulations about what could be sold in said canteen, here the student council just spends their evenings cooking pizzas and hamburger meat in the Home Ec room. Better still, they’re very generous with student-teachers who are willing to stay late cleaning pans! 7. Technology: While there are a handful of smartboards in the school (which I have likened to having a motion-activated toilet flusher in your bathroom…looks cool, saves a tiny bit of effort, but is not worth the $1000 investment), teachers are not afraid to bust out the ol’ overhead, and they do so with an enthusiasm that keeps students (and me!) engaged. That’s my kind of school! 6. Small town neighbours: My roommate (who is technically not my roommate since at the last minute we were placed in adjacent apartments rather than a house) is a super solid guy, and we have a pretty great open-door, open-fridge policy. We’ve also made friends with some of the other teachers and EAs, one of whom lives in our building also and showed up the other day with a bowl full of curried rice and chicken. So good! 5. Food: And on the subject of food, I suppose Reid and I both processed our initial feelings of homesickness by cooking. Every evening. In bulk. So now our fridges are literally burgeoning with leftovers, and we probably won’t have to cook again until we leave. 4. Informal Faculty Advisor relationships: An ‘FA’ is the person that comes to your school 3 times during your practicum to evaluate your teaching and decide whether you’re actually going to graduate or not. OR, in the case of the north, it’s the person who you pick up at the airport, wander all over town with looking for the person who took her bag (two identical MEC bags on one tiny puddle-jumping aircraft? Seriously!? ), then walk to school with each morning. Thanks, Barbara, for enjoying Gillam with us, and for all the wise teaching advice and encouragement! 3. More sports! 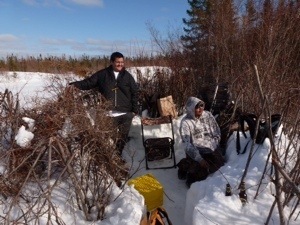 : I was called out of the lunchroom yesterday to witness the first official trapping practice of the season. Yes, trapping is an official sport of the Frontier Games, and students must race to set and break six traps twice. The record was something like 37 seconds, held by the all-school trapping champ, and I managed to do it in 1:43, which I figured was pretty good for a beginner. 2. 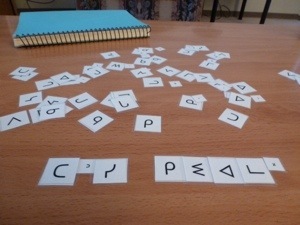 Cooperative learning: Through a fortuitous miscommunication (my Spanish-teaching course was titled “Teaching Aboriginal and World Languages”), I’ve been placed in a Cree classroom for the majority of this practicum. 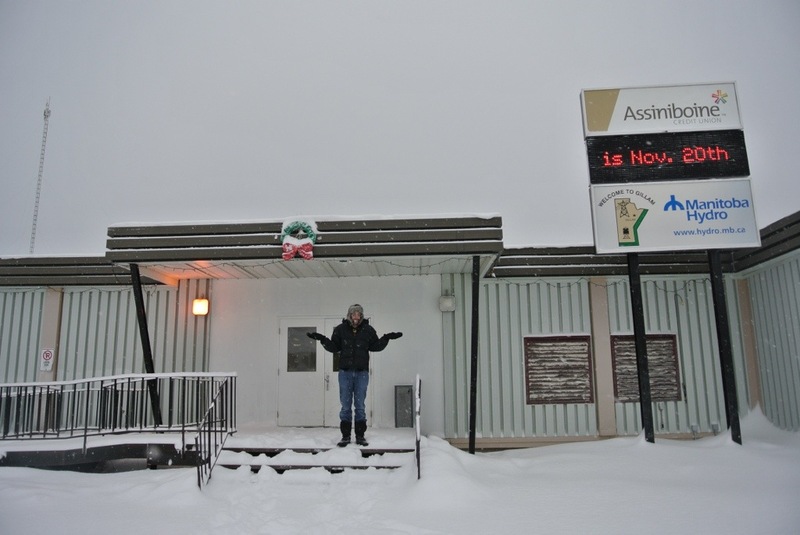 A grades 1-8 Cree classroom, no less. My CT in incredibly patient as I fumble with the 20-syllable words, and I’m learning lots about early years education as well. It’s certainly never boring, and it gives new meaning to the term ‘cooperative learning’, as I have very explicitly stated that the students are allowed to correct me if I make a mistake. It keeps them on their toes, which is good! 1. Best. School. Ever. :The school has 300 students, K-12, and as of yet I have not heard a single one disrespect a teacher or a fellow student. The positivity continues in the staff room, which has to be one of the most welcoming workplaces I’ve ever experienced. 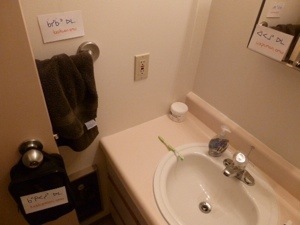 The theory is that it’s a perfect combination of expats (at least that’s how us ‘southerners’ feel) and born-n-raised Gillamites, so people have a lot invested in the community. Whatever it is, it’s an awesome place to be. Overall an incredible experience so far. As I said, I still haven’t managed to see much of the town in daylight yet, but hopefully we’ll remedy that this weekend.